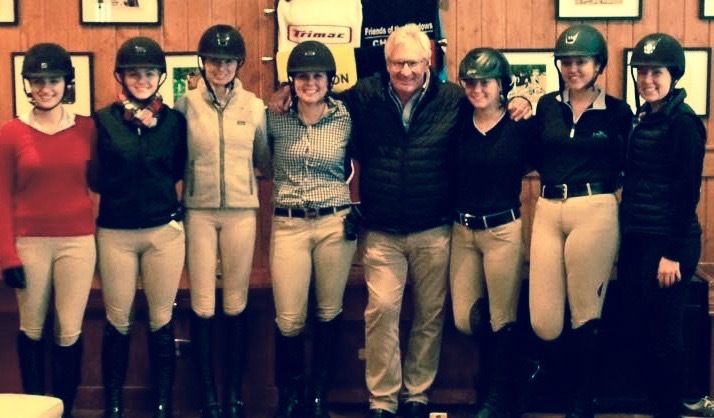 Frank Madden with Old Barrington trainer Amelia McArdle, assistant Julie Smith and clinic riders. Barrington, IL – October 10, 2017 – Old Barrington Farm welcomes nationally renowned trainer Frank Madden to their farm for a hunter/jumper clinic Saturday, November 11th and Sunday, November 12th, 2017. Madden will teach three sessions each day at heights of 2'6", 3' and 3'6". Limited rider spots are available and auditors are welcome. In addition to training and clinics, Madden also judges and serves on several national committees including the USHJA Hunt Seat Equitation Task Force. He received the “Developmental Coach of the Year” award from the U.S. Olympic Committee and the “Show Hunter Horseman of the Year” award in 2005 from the Chronicle of the Horse. The cost for riding in the clinic is $500. The cost to audit the clinic is $40/day or $65 for both days, which includes breakfast and lunch. For more information on available riding spots contact Joyce McArdle at 708-431-2235 or Jmcardle@oakbrookco.com. Old Barrington Farm is the premier Midwest equestrian center built by the McArdle family on over 60 acres of rolling land in the Village of North Barrington, Illinois. Old Barrington offers boarding and training programs in a state-of-the-art facility featuring a spacious heated indoor ring, outdoor ring, grass field, all-weather and grass paddocks and trails for riding. Just a short trail ride from the Equestrian Center, Old Barrington Estates is a unique residential community comprised of just 7 beautiful home sites ranging in size from 4 acres to over 9 acres. Each home of Old Barrington Estates may have its own private horse barn and has access to the Equestrian Center’s amenities. For more information regarding the clinics or Old Barrington Farm, please visit www.oldbarringtonfarm.com and www.obestates.com.